They can live on land as well as in water. They breathe with their lungs (like humans) and with gills (like fish). Their moist skin has no fur or hair. They have 4 legs, though some of them have none. They lay lots of eggs. 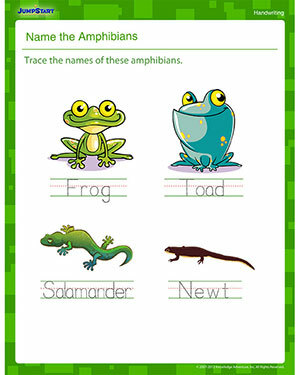 Practice tracing the names of these amphibians and learn more about them. Check out this printable handwriting worksheet today!